Furniture is a collection of lifeless objects, until you make it your own. Whether you are ordering a piece of custom furniture or taking something you have found at a fine furniture store to customize it and make it unique, how you display your furniture speaks highly about your personality. To get the best look, we at Carrocel believe you need to be selective in what you choose. 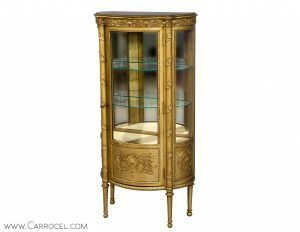 One of the easiest pieces of furniture to customize at home is a display cabinet. First, you will want to pick a cabinet that suits your existing living space. If your space is eclectic, vintage furniture will fit right in. Even if it is modern, you can incorporate pieces of vintage furniture, especially if they share similar wood characteristics. 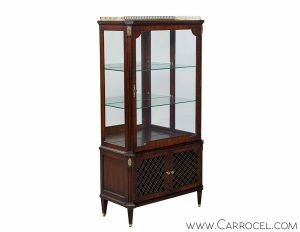 Carrocel has a wide range of display cabinets and bookcases to choose from including antiques, 19th Century bookcases and French-styles. Avoid Clutter – Display cabinets are just that: for display. Avoid the temptation to use them for storage. Most have cabinet areas where you can store miscellaneous items, but anything seen through the glass should be strictly for show. This will keep it from looking cluttered. Pick a Theme – Have some fun with your display cabinet and create themes based on holidays or the time of the year. For example, for Halloween you can add spooky decorations, such as spider webs, apothecary jars, glaring eyes, etc. inside to add a Halloween-esque feel. Make Sure There is Space – As a general rule of thumb, the top of your cabinet should only be used if you have more than two inches of workable space. Otherwise you will have a cramped décor area. The same goes for the interior of the cabinet. Put pieces where they have enough room to sit and do not let display items look as though they barely squeezed into place. Fill Empty Space – Sometimes a cabinet is too short; therefore, it begs to have something placed on top to fill the empty void between the top of the cabinet and the ceiling. In this case you will want to use only a few objects to fill that void, but do not let them go as high or even too close to the ceiling. You must have a few inches of clearance between the decorative piece and your ceiling to avoid making your room look cramped. Display cabinets are easy pieces of vintage furniture to customize. 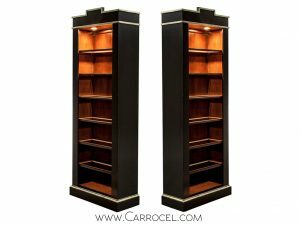 Carrocel luxury furniture store can help you add personality and flare to your existing living space with one of our stylish pieces. 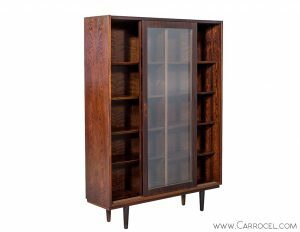 See our inventory of cabinets and bookcases online or call us at 416-999-2525 to learn more about custom furniture. To give your space a unique and elegant look, select some fine furniture and classic vintage pieces. Visit our showroom today.